Preparations for the AC Energy agroforestry model farm currently on the way. 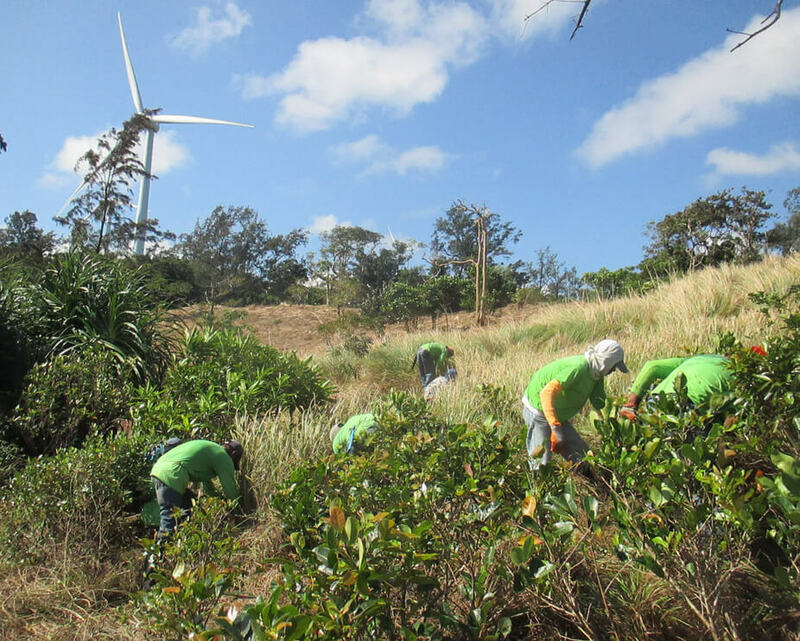 The AC Energy agroforestry model farm is located within the 625-hectare North Luzon Renewable wind farm in Brgy. Caparispisan, Pagudpud, Ilocos Norte. Sustainable development programs underway for communities and areas surrounding NLR and NW in Pagupud, Ilocos Norte. Following the efforts of AC Energy and North Luzon Renewables (NLR) in Pagudpud, the company has focused on furthering the development efforts and programs in the surrounding areas of NLR and NorthWind Power (NW). In Caparispisan, the implementation of an agro-forestry program is underway alongside the analogue reforestation of the area. In Bangui, AC Energy is moving to develop a marine sanctuary for endangered sea turtles. These projects are aimed at uplifting the livelihood of the neighboring communities and conserving the biodiversity in the areas of NLR and NW. In the mountainous terrain of Caparispisan, AC Energy and NLR kicked off the first phase of its agro-forestry program last month. With consultants from UP Los Baños, the team began a series of lectures and workshops with farmers that currently reside on the boundaries of the wind farm. The workshop was focused on the development of agricultural skills and was held last February 20 to 22, 2018. The 5-year program has three major components: To utilize idle land, increase the livelihood of the local community, and to protect the surrounding area. NLR stretches across 625 hectares of forest land, 4.5 of which will be dedicated to the creation of a model farm. A variety of sustainable farming techniques such as contour hedgerows, fruit orchards, and watersheds are some of the methods that will be used and taught to the farmers. Once completely implemented, the program would spur commercial agriculture to flourish, providing streams of livelihood for the residents of Caparispisan. Alongside this effort, an analogue forestry program is currently being implemented to replenish the forest’s depleted resources. Analogue forests are a regenerative system that involves re-growing trees and other flora that mimic natural forests while also providing income for local communities. Together, these projects are aimed at empowering communities to support themselves while ensuring conservation of natural resources. Meanwhile, in Bangui, AC Energy and NW have hired biodiversity experts to develop a turtle sanctuary in the surrounding areas the wind farm. Several species of marine turtles have been observed laying eggs and nesting along the shoreline of Bangui Bay. Most of the turtles present in the Philippines are considered endangered species, some of them critically endangered. According to the Marine Wildlife Watch of the Philippines, only one percent laid turtle eggs survive. Moreover, the turtles themselves are in danger of poaching, smuggling, and the problems caused by sea pollution. Biodiversity baseline analysis is currently being conducted in order to document and assess the existing ecosystem and biodiversity conditions of the wind farm. It is envisioned that the turtle sanctuary will not only protect the turtles of Bangui, but will create opportunities for the community through ecotourism. AC Energy reiterates its commitment to the Ayala group philosophy of creating value not just for its businesses, but for the environment and communities where they operate. It is the goal of these projects to ensure that Caparispisan and Bangui will be able to fully support the development and prosperity of the region, ultimately moving towards self-actualization and contributing to national progress.